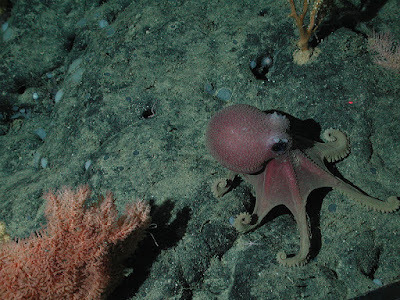 The Octopodidae is a diverse group of benthic octopuses, including the majority of familiar octopus species. Characters (from O'Shea 1999): Body muscular to gelatinous; suckers uniserial or biserial; radula heterodont, occasionally homodont; digestive gland anterior to stomach and caecum; hectocotylised arm not autotomised at maturity; mantle-locking apparatus absent; shell vestige occasionally present as stylets in mantle; ink sac present or absent; light organs absent. [H88] Haimovici, M. 1988. Eledone gaucha, a new species of eledonid octopod (Cephalopoda: Octopodidae) from southern Brazil. Nautilus 102 (2): 82–87. [S72] Stunkard, H. W. 1972. Clarification of taxonomy in the Mesozoa. Systematic Zoology 21 (2): 210–214.